Arguably Berlin’s finest restaurant, the Northland Restaurant and Dairy Bar has been a local favorite for many years. Residents and visitors alike swoon about the fresh seafood, hearty meals, fresh sandwiches and generous salads. Make sure you don’t leave there before you sample one of their sumptuous desserts. Just a tip: you may want to try a piece of fresh berry pie with whipped cream when in season! 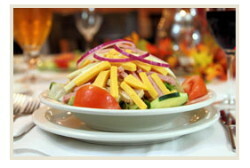 Come experience the quiet mood and great surrounds of this restaurant overlooking the Androscoggin River. The Northland Restaurant and Dairy Bar has a full liquor license, and has a function room available for bigger get-togethers! Open year round 11:00AM to 9:00 PM. Winter hours subject to change. Closed Christmas Eve and Christmas Day.